Time to think about next year. The oats are combined and sold, the straw is in the pole barn (waiting for a customer – anyone need a round bale or 22?) and Tou Pau’s corn is gone though there are still squash and over-ripe cucumbers in his field. What have I learned so far? 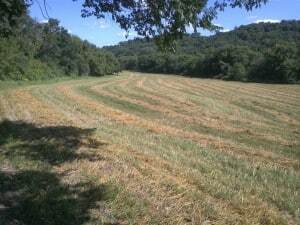 The oats/alfalfa plan is a good one for organic transition but not for the long-term: there isn’t enough profit in the crops to pay the rent. The future of this farm needs to include higher value crops – but which ones? I’m intrigued by hops and my grape-growing neighbor is encouraging me, but what else? add to the knowledge base of the farm: what works, what doesn’t, why? With 25 tillable acres there is room for more than one project. At the moment I’m thinking that two or three trials might be good with the balance in hay (that’s what the alfalfa’s for). What are the best next steps for this farm? Pondering . . .